Another former Arby's on Maple Street in Carrollton was demolished last year and rebuilt as a Waffle House, without a drive-thru. The Stone Mountain site was reportedly "in better condition" (despite the fact that it had been vacant longer) and only needed a remodel to achieve the chain's goals for the site. Waffle House is not the only eatery not previously associated with drive-thru but now offering the service. In 2013, Panera Bread and Jason's Deli both opened new locations on Barrett Parkway in Kennesaw that feature drive-thru ordering. Panera Bread also opened a drive-thru equipped location near the Mall of Georgia last year. A drive-thru is a great way to increase sales, but operators must be offering products that are easily made and which offer little room for modification, in order to be as efficient as possible. At least 50% of a typical fast food businesses revenue is derived from its drive-thru. This fact made Krystal's choice to open an inline location in Tucker very strange. The restaurant was situated in the middle of the Best Buy-anchored shopping center near Northlake Mall. Even before it opened, I questioned the feasibility of such a move. Low and behold, just six short months after opening in early 2012, the location closed. What are your thoughts? Will Waffle House find drive-thru a success or is the "Waffle House experience" lost when one does not actually "experience" the inside? 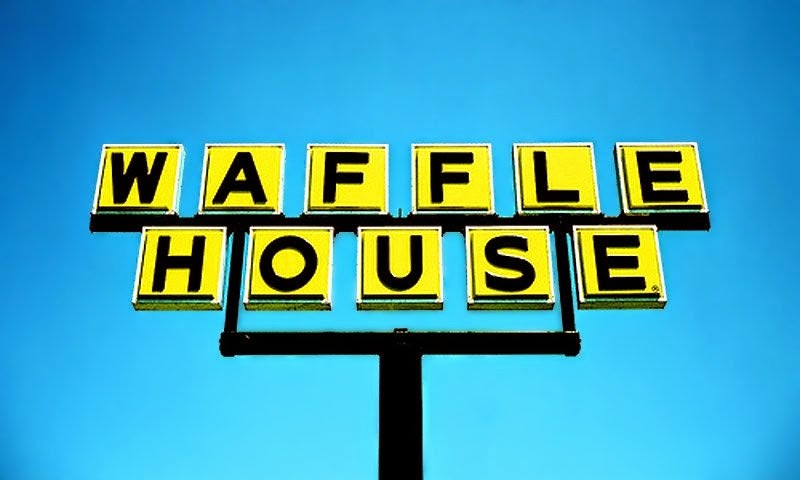 If it's successful, where would you like to see another drive-thru Waffle House open? The Panera on Windward Parkway also has a drive thru. I'm kind of skeptical as to how this will work, since the food is pretty much all made to order. Burgers can be pre-made and wrapped up, I'm not sure about waffles. Also, can you see what (if anything) is going on the former Hardee's turned Don Taco turned Juua Fashion Jewelry Accessories site? This building (at Buhi and Oakcliff) was leveled about 6 weeks ago. I like the idea of repurposing an unused space, but I assume that means Waffle House will close their other nearby location. Moving directly onto HWY 78 from the side road they’re currently on may help them catch more of the morning rush hour traffic. However, not sure about the drive through window other than coffee the Waffle House menu doesn’t seem to fit that style of service. They may have to offer some more portable menu items. Or function as a car side takeaway like outback or carrabbas. I can't see much on their current menu that's easily eaten in a car - at least one that is moving. You can already get to-go orders from WH, why not add the ease of a drive-thru? I know sometimes at lunch, there are certain places I'd like to go, but don't have the time to go in and sit to eat (Panera, Corner Bakery, etc.) so I think a drive-thru is kind of a neat concept to test. I remember when that building used to be a Ken's Pizza many moons ago before it was converted to an Arby's. My question is why do so many arbys close? That's a very good question. If you google Arby's closing you get results from all over the country. Wyoming, Alabama, Virginia, of Arby's suddenly closing, without notice. It's happening all over. I am not sure why. I'm pretty certain there is a drive thru at a Waffle House in Lexington, KY (off Tates Creek Rd) that I noticed when I was there visiting one time. I was hoping it was going to be ON TOP of Stone Mountain. Now that would be special.